Published September 7, 2016 By Anna T. This post may contain affiliate links. Regardless, I only recommend sites I've researched and/or used and trust. This post was sponsored by Studypool. All opinions are my own. Looking for a way to put your academic expertise to work and earn some money? Studypool is an online tutoring site to consider, and it's growing in popularity with as many as 10,000 student questions posted per day. You can sign up as an online tutor for Studypool and get paid to answer homework questions and assignments from students. Who is eligible to sign up as a Studypool tutor? If you want to be a Studypool tutor, you need to be either enrolled in a college or university, or have a higher-education degree. How much can you earn tutoring for Studypool? Your Studypool earnings will vary. Basically, you browse the available questions until you find one you think you can answer. Then, you bid whatever you think it's worth. If you win the bid, you'll receive the agreed upon amount after the question has been answered satisfactorily. Studypool keeps between 10 and 30 percent commission on each question you answer. This is their cut for the platform and service they provide to both tutors and students seeking academic help. Note that learning to bid effectively is sort of a skill, but fortunately Studypool has created a guide to bidding here that you can check out before you begin. 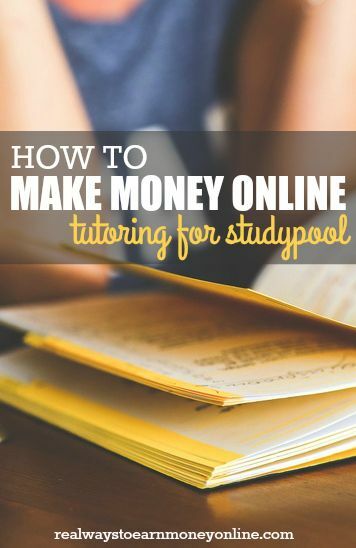 Some Studypool tutors use the site for extra cash here and there, while others make a full-time income there, earning as much as $500 a week or more. How does Studypool process payments? Studypool uses Paypal for sending out payments. You just withdraw your earnings from Studypool when you're ready to get paid, and they will process the payment within three business days. Is there a set schedule with Studypool? There isn't! That's one of the best things about this. It's definitely one of those “log in and work whenever you want” opportunities. This is great because you can easily work it around any of your other responsibilities. Keep in mind that although there is no set schedule, there are deadlines. You will have agreed to a time limit for each homework question you help with. You will want to finish within the time frame to receive good feedback and repeat customers. Could you get ripped off using Studypool? No. This is because Studypool actually accepts the money from the student before you ever answer the question, and then holds it until the question has been answered satisfactorily. How do you start tutoring for Studypool? If you're interested in becoming a Studypool tutor, you can go here to get started. Note that at this time, they are only accepting candidates with Facebook accounts. Good luck, and please comment to let us know how it goes for you! I’m not familiar with this service. how many students and tutors, approximately, are on the service? What if the student is all happy with the answer but still leaves a bad review and states the answer was not satisfactory – How will the Tutor be compensated for a good work if the Student says is no good ?? ?